Have You Started Getting Knee Pain? And don’t know why? Many of you have just turned over a new leaf, you may be 2 weeks into to your new year’s resolution of getting fitter and healthier. You have started to move a lot more, be that hitting the gym, running, cycling, swimming or walking. All of a sudden your getting aches and pains in joints and muscles you never knew you ever had! Do not be disheartened help is at hand and what you are feeling is perfectly normal. You have basically given a shock to your system and it will take a bit of time to get used to the new you. However, if the pain you are feeling is persisting more than 3-4 days it’s best to get it checked out before it gets any nastier and puts a stop all your good work to date and your personal goal. This time of year we see an influx of people into our clinic just like I have described above. These people are smart people! One of the main reasons people regress on fitness regimes is due to simple injuries, 99% of which are simple to fix! With the correct treatment of course! But the key is not to leave it go too long. One of the most common injuries we see this time of year is knee pain, particularly on the side of the knee or the front of the knee. These always manifest when people go from zero to 100 miles an hour over a short period of time in relation to there training regime. Are you are feeling pain on the outside of your knee or on the side of your thigh but you haven’t had a twisting injury or taken a fall to that knee you may well be experiencing IT Band pain. Typical symptoms with ITB syndrome include pain or tightness on the outside of the knee at or just above and below the level of the knee cap which can move all the way up the outside of the leg to the hip. Symptoms are typically worse with activity and leaving your knee bent for a period of time. 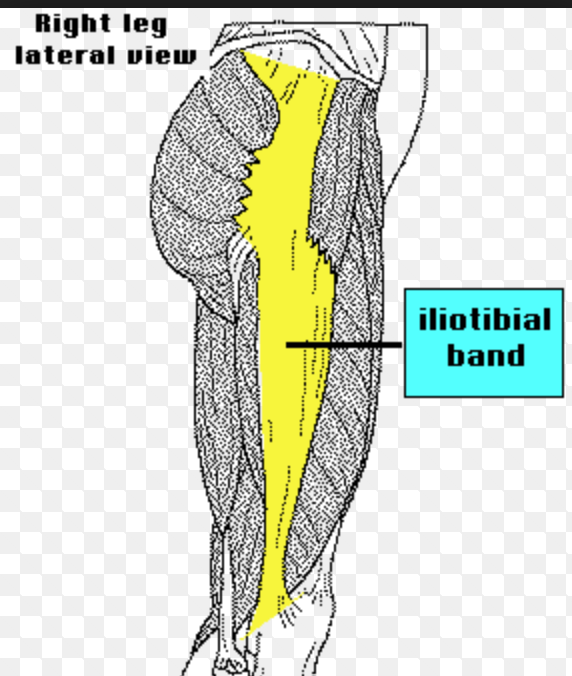 The ITB is a thick fibrous band that runs from the outside of the hip, all the way down the outside of the thigh to insert just below the knee joint on the tibia. We often get this pain where the band attaches to the knee joint because the band has become tight and almost ‘pulling’ at this junction. This results in the band being a) pulled tight over the femur (big upper leg bone), and b) repeatedly dragged back and forth over the bone as it helps bend and straighten the knee. What we mean by this is that the symptoms you experience here are most likely to be caused by some dysfunction either around and above the hip and pelvis or down in the ankle. You must remember that your knee doesn’t just have to straighten and bend when we walk or run. The lower leg bones (fibula and tibia) have to be able to rotate on the upper leg bone (femur) and vice versa. And yes, even this needs to happen when we are running and walking in straight lines! An inability to control these forces and rotations through weak or non-functioning muscles can lead to this type of knee pain. We regularly come across people in the clinic who have poor breathing patterns. We find many of them are mouth breathers and don’t sufficiently use their diaphragms – this can cause havoc with your posture. Most mouth breathers tend to have ribs that flare out quite a bit. Unfortunately, this rib flare can lead to an increase of lumbar lordosis in the spine increasing the tilt of your pelvis forward (what we call anterior pelvic tilting). Anterior pelvic tilting will lead to lengthened hamstrings, weakened and lengthened glutes, and tightened quads. This will affect how you walk or run causing the Knee joint to overload and experience this type of knee pain. Strengthen your hamstrings and Glutes in a posterior tilted pelvic position. The role of the glutes is to primarily extend the femur. This is very hard if you are in an anterior pelvic tilt position. It is important to maximise the muscles that will give you the greatest control of your posture and the muscles that will propel you forward to maximum effect when running and walking. Hip thrusters are proven to be one of the most effective ways to do this. We find most people have long weak hamstrings, a 90-90 hamstring exercise that focuses on diaphragmatic breathing is a great way to strengthen hamstrings and improve your pelvic positioning. These exercises can be found on TC physiotherapy youtube page. Although the exercises above are all highly effective to help the tissues around your knee joint, the key is to find YOUR specific root cause of the problem. Therefore we never just prescribe the same exercises for two people with the same symptoms because we are individuals and our postures are all completely different. It is generally a good idea to get a qualified clinician to assess your posture as it will speed up the process and get you out of pain faster. New year, New me, New injury!! !